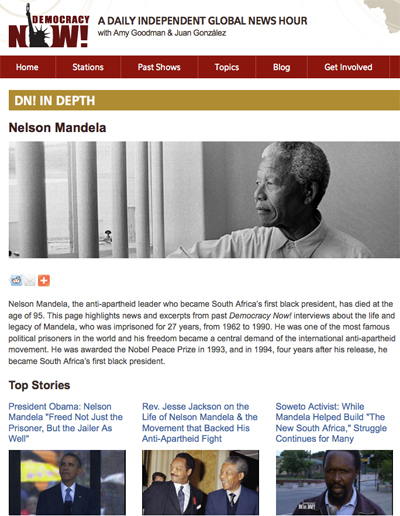 In-depth analysis of Nelson Mandela's legacy by Democracy Now! In-depth analysis of Nelson Mandela’s legacy by Democracy Now! Categories: Activism, Africa, Culture, Education, Justice, Media, Politics, Prison Industrial Complex, Rights and Liberties, World News, tagged Democracy Now!, Nelson Mandela, President Barack Obama, Rev. Jesse Jackson, South Africa by admin. Bookmark.